We all judge. They say don’t judge a book by its cover but if I see a video vixen holding a gun with bricks of coke in the background titled Trap Lady: I Nu It Was Time; I feel like I know exactly what kinda book that is and its intended audience (#40) Impressions matter, appearances matter, words matter. There’s a negative connotation that’s always associated with judging, it’s always used to elucidate unfair, prejudiced thought. Hi Respectability Politics brigade. The other misconception is that to judge means one thinks they are better. When I say I judge someone its really to say, “hm I wouldn’t do that” or “I wonder what’s the story is there”. As an INFJ (#37*), I observe, I wonder, I theorize. My “judgement” is moreso rooted in curiosity. Just the other day, I ordered a veggie burger with real bacon, the cook probably judged me, but he’s considerably older than me with a mohawk, so I’m judging him (#46*). (But for real its like he’s Jordan bald and then this crimpy strip of hair or its actually braided, like who is braiding this inch wide strip of hair routinely….you don’t have the answers Sway. I judge people every day, sorry Tupac I’m inquisitive. I can’t help but wonder why some people say and do things. There’s probably a valid reason for all (25? 100?…eh I’ll do 50) of these things (okay some are inexcusable) but hey, ima judge anyway. 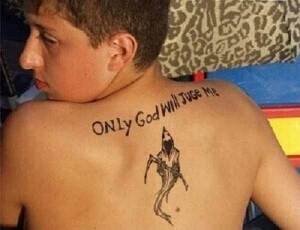 Cuz only God can judge me. Boom. Flipped that. I severely judge people who do this. I once read a book (close but not quite literatcheture) by an author who wrote the entire book in passive voice in addition to numerous spelling errors. I had to get on the struggle bus to finish it. That list is hilarious! I’m so glad I found your blog. I’m currently binge reading all your posts. Judge away.